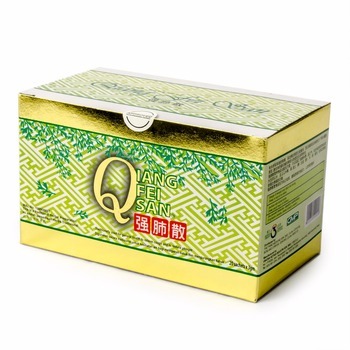 Qiang Fei San (MAL 19990889T) is a health supplement made from various types of superior and nutritional herbs. Its herbal composition performs a direct fundamental function in tonifying lungs organ, stabilizing bodily defensive energy, stiffening bodily skin-hairs as well as a complementary function in lungs organ by regulating and nourishing on spleen and kidneys' organs. 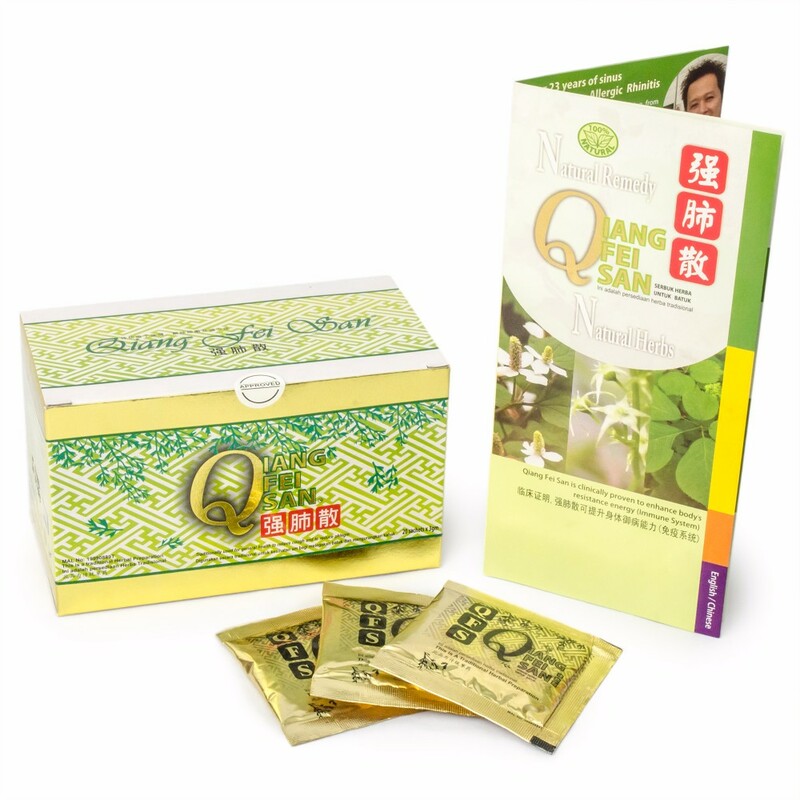 Hence, QFS works effectively in revitalizing lungs and respiratory system's resistance ability. Panax ginseng C.A Mey - used for nourishing lungs, strengthening four organs, relieving cough, restoring lungs energy, promoting blood circulation and retarding ageing process. Panax quinquefolium L - used for strengthening lungs, relieving persistent cough, reducing lungs' heaty and excessive phlegm. Glehnia littoralis F.Schmidt ex miq - used for clearing lungs, expelling bloodshot phlegm, soothing lungs' heaty and relieving cough. Cordyceps sinensis (Berk.) Sacc - used for revitalizing lungs energy, clearing phlegm and cough, strengthening kidney, treating senile chronic cough and anemia. Gynostemma pentaphyllum (thund.) Mak - used for soothing inflammation, detoxification, relieving cough; expelling phlegm, relieving chronic bronchitis, preventing ageing, reducing blood fat, strengthening immune system and sedative-hypnotic. Hohttuynia Cordata Thund - used for relieving lungs suppurative, bloodshot cough, stinking smell phlegm, clearing heaty, detoxification,relieving pneumonia, running sore, eczema and scabies. Default shipping using Airpak Express. 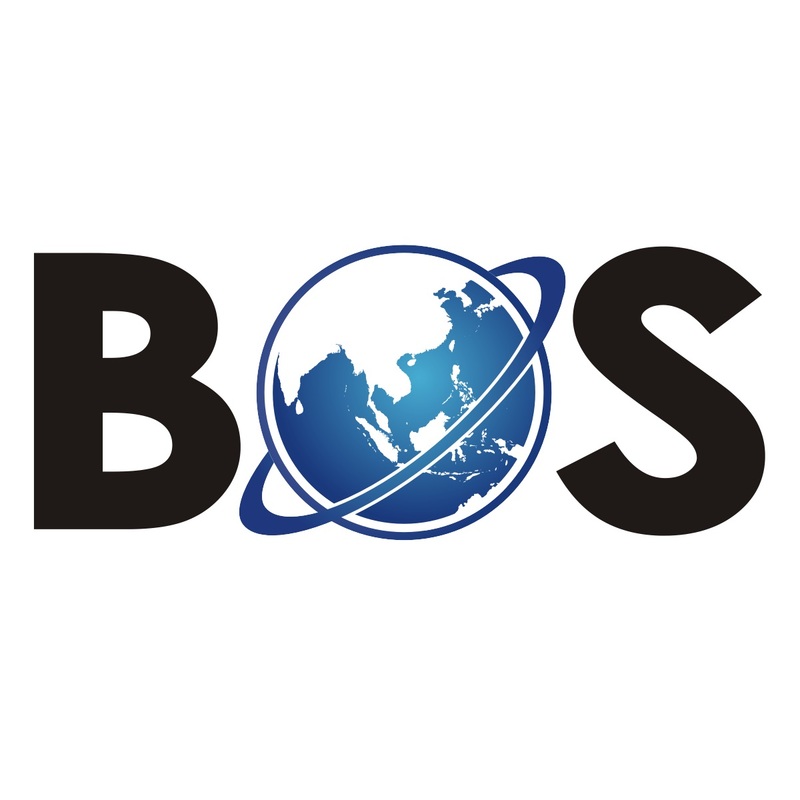 BOSLAND CORPORATION (M) SDN. BHD.